Mary loves to visit Las Vegas, as she loves playing the slots. She scouts casinos for “loose” machines, or slots that charge lower gambling fees. She, like other Vegas vacationers, always loves a good travel deal. She wants to get the most for every dollar spent. That is why she booked a day trip to the Grand Canyon with our company, Grand Canyon Destinations. Many of our passengers, like Mary, find the nearness of the Grand Canyon enticing. That is why we book bus travel for many Vegas vacationers. People count on our family-owned local company to provide them with timely pick-up and dependable luxury bus transportation. A Las Vegas – Grand Canyon tour with us will nicely round out your Vegas itinerary. When you book travel to the Grand Canyon with our service, you only need to lie back and treat yourself to the sights along the way. Once you arrive at your destination, you will be glad you took a luxury bus. By selecting this mode of transport, you don’t have to worry about renting a car or getting lost. We take care of all the travel details. Our friendly tour guides provide passengers with insights and information about attractions and sites, and point out picture-taking opportunities. By going by luxury bus, you can feel confident that any Las Vegas – Grand Canyon bus trip will be stress-free and memorable. Our scheduled trips to the West Rim and South Rim also include a stop at Lake Mead and Hoover Dam. 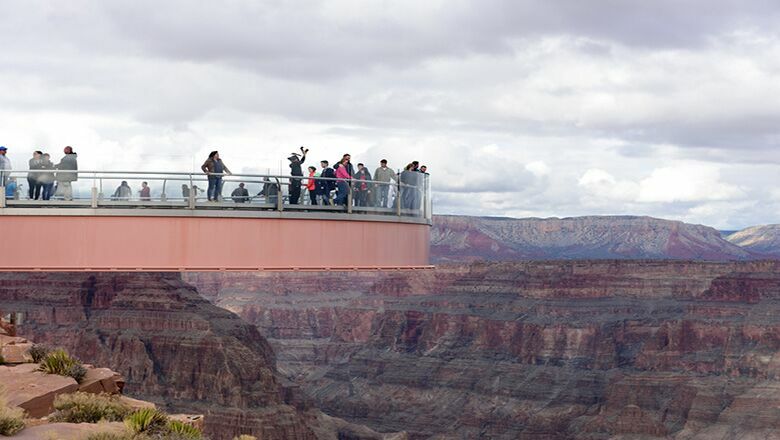 The Skywalk, located at Eagle’s Point in the West Rim, is yet another popular attraction. Projecting out over the Canyon’s rim, the cantilever type bridge allows visitors to see down into the Canyon’s depths. The bridge’s glass walkway permits a one-of-a-kind viewing experience. On your trip to the Canyon, you will see sights that can only be seen in the Southwest US. If you want to add to your Vegas trip and enjoy a once-in-a-lifetime journey, schedule one of our Las Vegas – Grand Canyon tours today. Call us and book a day trip now.